I thought about getting a hat rack in my room, but it was one more thing to put in my room. I didn't really want to clutter my room even more. I didn't find any hat racks that I like either. I also didn't want them to be stacking on top of each other because I didn't like the idea of piling them up. Being unable to see them in plain sight makes it easier for me to forget that I have them. I searched online to see how other people are storing their hats. There were plenty of DIYs on how to store baseball caps, but not so much on how to accommodate my wide brim hats. Some of them requires multiple holes in the wall for hooks which I wasn't really too excited to do. I didn't find anything that was aesthetically my taste. So after some brainstorming with my boyfriend. We figured out a way to store my hats that will also go with the decor of my room. It is also customizable by just adding another braided rope or rearranging the pins to how ever I want it to. It even nicely displays all my hats on the wall with only using two nails on the wall! 1. Drill a hole on both ends of the dowel. Make sure that the holes are aligned. 2. Cut a piece of twine and tie a knot half an inch from the loop. Insert one end of the twine in the hole in the dowel. 3. Wrap the other end around the dowel and tie a knot. 4, Tie both ends into another single knot to secure it. Repeat same step to other side. 5. For the braided rope, cut six 8 ft long strands and fold it in half. Tie a knot an inch down from the loop. 6. Section three sets of 4 strands for the braid. 7. Start braiding. Make sure to keep the braid as flat as possible. 8. Secure the ends by tying a piece of twine at the end of the braid. Trim any excess. 9. Glue together the clothespin and the bar pin using a glue gun. Make sure to have the clasp upside. 10. Assemble everything together. Hang your dowel using two nails and wrap the rope braid around the dowel by inserting the end of the braid in to the loop. 11. Arrange and pin clothespin onto the rope braid. And that's it! 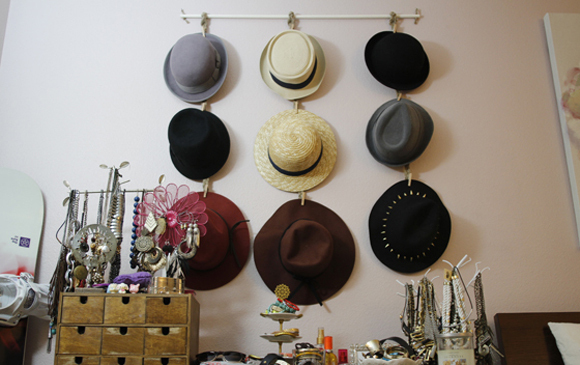 This is a pretty easy and inexpensive way to get your hats organized. All of the materials used for this DIY can easily be found at your local craft store. Hope you enjoyed this tutorial! Feel free to suggest any DIY ideas on the comments down below. And if you decide to make your own hanging hat organizer, please share them to me by tagging me on Twitter or Instagram and using the hashtag: #beautybitten so I can see it! I really love you black and gold hat! where did you get it?